Compilation CD released 22nd November 2010 with over an hour of great tunes handpicked by Dandelion Radio DJs, many of which are taken from sessions recorded especially for this station. Available for for just £6 from Odd Box Records and all good real and online record stores. Click here for tracklistings and more info. 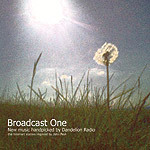 Limited edition free download-only compilation released by Mark Whitby’s Unwashed Territories netlabel to mark Dandelion Radio's fifth birthday in June 2011. New recordings, tracks from Dandelion Radio sessions and favourite tracks from our first five years. No longer available - was only released from 1st June 2011 to 31st July 2011.